Current designation: 1. Director, Department of Urogynecology, Medway Women Centre & Urogynaecology Research center in Chennai , India. 2. President of URPSSI (Urogynaecology & Reconstructive Pelvic Surgery Society of India). 3. Former Head of Department of Urogynaecology at Madras Medical College, India. 4. Professor Emeritus The Tamil Nadu Dr. MGR Medical University, Tamil Ndu, India Currently member of editorial board of •	Journal International Urogynaecology (official journal of International Urogynecological association) •	TOG - The Obstetricians and Gynecologists - journal for continuing professional development by the Royal College , United Kingdom Certified in "Prevention and Repair of Perineal Trauma / Episiotomy through Coordinated Training" PROTECT (2013) and member of steering committee of PROTECT. In past, served as a member of “Surgery for Pelvic Organ Prolapse” Committee - 4th International Consultation on Incontinence (ICI), Paris. 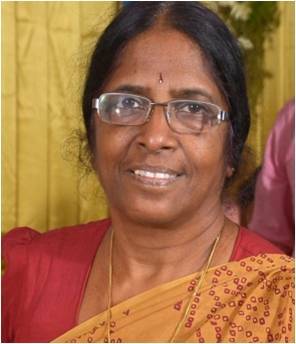 She established Urogynaecology specialty in India and rendered her clinical services through the Government Kasthurbha Gandhi Hospital, Chennai from 1982 till 2012. An exclusive Fistula ward was founded by her in 1993 and fistula victims were provided with specialized care and treatment services. She has trained OB GY and Urology specialists in Urogynaecology through fellowship program from 2007, which enabled the availability of specialized urogynecological services through the trained specialists to almost all states in India. Her special area of interest is in reconstruction of pelvic floor for pelvic organ prolapse and management of urinary incontinence particularly fistula. She has organized IUGA exchange program (2008) & IUGA regional symposium (2018) in Chennai She has received noteworthy awards and honors like •	“Ulf Ulmsten Speaker Award" by International urogynecological association , Taipei 2008 •	“Baden Lecturer" Award by the Scott & White Hospital and Clinic, Texas A & M University System Health Science Center, Temple, Texas, USA 2006. •	“Keynote Lecture: Pelvic floor surgery - the challenges" at XIII Meeting of Australian Gynecological Society (AGES), Melbourne, Australia 2012. •	"Life Time Achievement Award & "Best Doctor Award" 2012-13" for recognition of services in the field of medical science by The Tamilnadu Dr. M.G.R Medical University •	Honored with “Kalpana Chawla Award 2009” by the Hon‘able Chief Minister of Tamil Nadu Has published her research widely, contributed numerous chapters to books and has authored a book "Urogynaecology an Indian Focus ". Active reviewer of international and National journals.